S’Arenal (Majorca) The Spanish team dominates the 49er European championship– Madrid 2016 at the end of the third day in Club Nàutic S’Arenal. 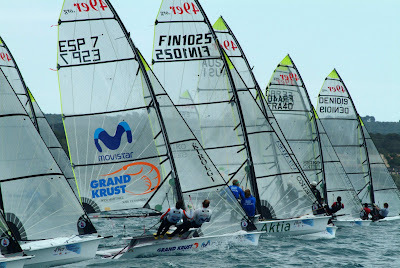 Iker Martínez & Xabi Fernández are still the leaders and second place is now for crew from Asturias Federico & Arturo Alonso although they are tied with third and fourth classified. But the Athens 2004 gold medallists and our representatives at the 2008 Beijing Games have already an eight point advantage over their immediate rivals. Strong, gusty and changeable SW winds of an average speed of 18 knots blew again in the bay of Palma. The Race Committee of Club Nàutic S’Arenal gave three starts today in the two racing areas in which each group competes. These were the last races of the qualifying series and tomorrow the 54 boats fleet – representing 22 nations- that participate in the 49er European championship- Madrid 2016 will sail the final series, divided in groups Gold and Silver.